In any week in the newspapers, in parliamentary debates, in discussion programmes on both radio and television, the remark "as Dr Johnson once said" frequently occurs, followed by a pithy and erudite quotation. 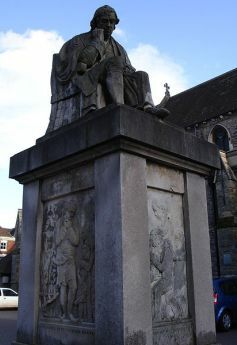 The curious fact is that but for a young and often inebriated Scottish lawyer called James Boswell, the name of Samuel Johnson, Dictionary or not, would have been forgotten long ago; few people have read a word of the poems or essays. Boswell's biography of the "Good Doctor", whom he met in 1763, is a work of genius, so real, so modern in its immediacy, that its subject remains untouchable to this day. Johnson's fame is due in part to the success of Boswell's Life of Johnson. Boswell, however, met Johnson after Johnson had already achieved a degree of fame and stability, leading Boswell's biography to emphasize the latter part of Johnson's life. Consequently, Johnson has been seen more as a gruff but lovable society figure than as the struggling and poverty-stricken writer he was for much of his life. Boswell's biography is important not just for its listings of what its subject achieved in literature and scholarship, but rather for its portrayal of a human being, flawed, eccentric, opinionated, dogmatic, above all lovable. On over-indulgence with drink, to the extent of becoming a beast: "He who makes a beast of himself gets rid of the pain of being a man." Anecdotes of the Rvd Percival Stockdale (reprinted in "Johnsonian Miscellanies", edited by G.B. Hill). "A man of genius has been seldom ruined but by himself." "Sir, a woman's preaching is like a dog's walking on his hind legs. It is not done well; but you are surprised to find it done at all." "Much may be made of a Scotchman, if he be caught young." "Human life is everywhere a state in which much is to be endured, and little to be enjoyed." "A man, Sir, should keep his friendship in constant repair." "No man will be a sailor who has contrivance enough to get himself into jail; for being in a ship is being in a jail, with the chance of being drowned." Definition of "oats": "A grain, which in England is generally given to horses, but in Scotland appears to support the people." On London: "Sir, if you wish to have a just notion of the magnitude of this city, you must not be satisfied with seeing its great streets and squares, but must survey the innumerable little lanes and courts. It is not in the showy evolutions of buildings, but in the multiplicity of human habitations which are crowded together, that the wonderful immensity of London consists." "We must either outlive our friends you know, or our friends must outlive us; and I see no man that would hesitate about the choice." "Exercise!! I never heard that he used any: he might, for aught I know, walk to the alehouse; but I believe he was always carried home again." On America: "How is it that we hear the loudest yelps for liberty among the drivers of negroes?" "Life is a pill which none of us can bear to swallow without gilding."